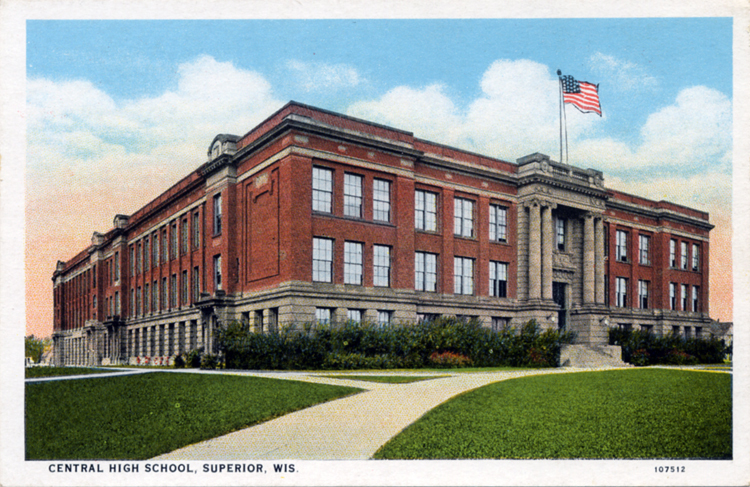 Several famous people have graced the history of Superior’s Central High School. Richard Bong, top American World War II flying ace, went to school here, as did legendary football star Ernie Nevers and Minnesota Vikings’ coach Bud Grant. Herbert Hoover announced his presidential candidacy on its steps, and John F. Kennedy stumped there during his presidential campaign. But the high school is most famous for acting as the “Summer White House” in 1928. President Calvin Coolidge spent his summer at the estate of his friend Henry Clay Pierce, fly fishing on the Brule River. On June 8, officials announced that part of the school library had been “fitted for the use of President Coolidge during his summer stay when the school will be the capital of the United States.” After he returned to Washington, the room Coolidge used became known as the “Coolidge Room” and was the site of senior teas and gatherings of the honor society; later, it became a notorious detention hall. Despite public outcry, the building—Superior’s most historically significant structure—was razed in 2004, the same year the city celebrated its 150-year anniversary.